The Kaweskar Route explores the Southern Ice Field, located in the southern Patagonia. It covers an area of almost 14.000 km2 to approximately 350 kilometres long and it produces 48 basins which origin is glacier. It is considered as one of the main reserves of fresh water in the world, which is one of the most important glaciary regions in the Patagonia, where there are the Amalia Glacier and Calvo Fjord. This journey takes its name to honour the Kaweskar natives who lived in this area. The route navigation ice fields south sailing from Puerto Natales to the Amalia Glacier, visiting glaciers as El Brujo, Fernando, Captain Constantine, Calvo Fjord Fjord Mountains to return back to Puerto Natales on a round trip itinerary (of return to Puerto Natales). The M/N Skorpios III, does this same itinerary which accommodates 110 passengers in its 49 cabines, set sails twice a week and navigates from september to april. It departs from the port station of Skorpios in Puerto Natales, the famous southern chilean city because it is near to Torres del Paine. You can get there to Punta Arenas and then we take a bus to Puerto Natales, even in high season it might be direct flights. You can also get there by bus from El Calafate. The motorship has advanced technology regarding to telecommunications and it includes satelital navigation. Its cabins are covered in native woods and they are air-conditioned. There are master suites, junior suites, marital doubles, A and B doubles and singles. All of them have private toillet, LCD TV, frigobar, functional music, electronic locks and safe deposit boxes. The ship has decks, rooms and dinnig-rooms for 130 people. During the journey, the lectures will be translated to english at the same time. It has 2 bars for smokers and non smokers. The motorship M/N Skorpios III, was built in 1995 by the very same shipyards of the Kochifas family, The ship is 70 metres long and 10 metres beam, and almost 3,5 metres of draught, a little bigger than the Skorpios II. Its cabins are decorated with wood which are distribuited in 5 decks, all of them with private bathroom, TV LCD and background music. Accommodations can be marital or twin cabin. The ship offers two stylish bar rooms, one of them is the main dinning-room or Quitralco room allowed for smokers and the other one is the San Rafael Bar allowed for non smokers. Day 1 - Puerto Natales, Patagonic Channels. 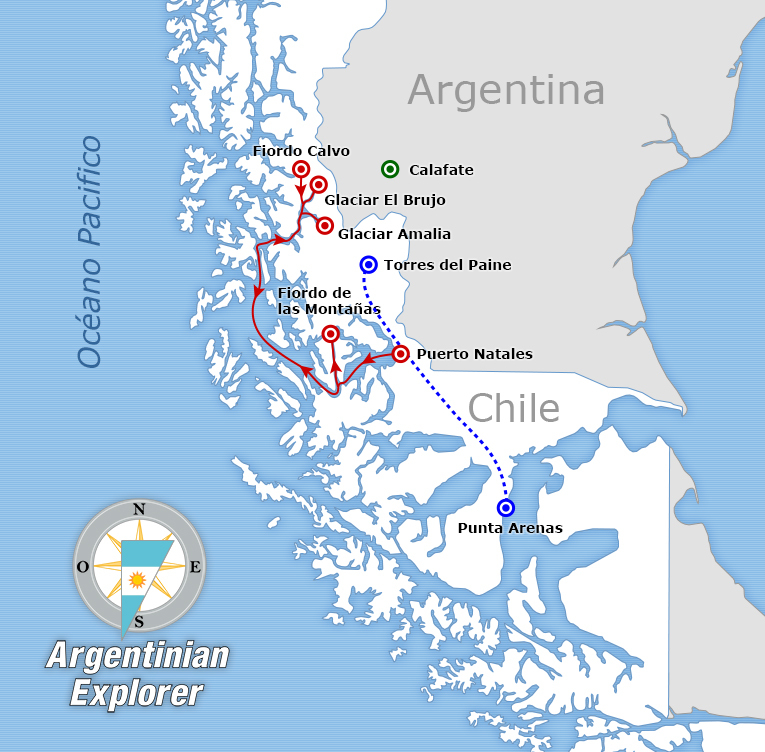 We will sail from Puerto Natales to start our journey along the patagonic channels od Angostura Kirke, Morla Vicuña, Unión, Collingwood and Sarmiento. Day 2 - Amalia Glaciers, El Brujo, Fernando, Alipio & Calvo and de Las Montañas Fjords During the morning, we will arrive at Amalia Glacier, to which we will get as closer as we can. We will leave the Amalia Glacier to look for another glacier: El Brujo. Before midday we will get to El Brujo Glacier, we will try to descend if the ice and weather conditions allows us to. As soon as the sunlights are in a perpendicular position to the earth´s crust, we will sail to go look for the Calvo Fjord. Once we get to the fjord, we will do a visit on board the Constantino Captain´s ship so we can cross the ice and arrive at the Fernando, Capitán Constantino and Alipio Glaciers. At twilight, we will set sail to de Las Montañas Fjord. In the morning, we will visit de Las Montañas Fjord with our main objective to watch a great quantity of glaciers which hang off the Cordillera de los Andes. We will go to know the Bernal Glacier, where we will do a trekking along the vegetation to end in the base of the glacier. We will also get to Herman Glacier where we will tour the bay and we will appreciate its natural beauty together with the different shades of the ice floes. All this will be made if the tide conditions allows us to. Continuing with our glaciers discovery, we will see the Alsina and Paredes Glaciers. In the afternoon, we will return to de Las Montañas Fjord to set sail and navigate to the Angostura Kirke crossing. At night we will get ready for the farewell party together with a dinner with the captain and a ball. After this special night, we will draw in the Skorpios Terminal in Puerto Natales. We will disembark in the terminal in Puerto Natales, those who payed for the transfer service by bus to Punta Arenas´ Airport, they will be waiting for. End of our services. No se debe abonar ningún impuesto portuario durante la navegación, sólo se paga la tasa de embarque, que es de aproximadamente 10 U$. En la Ruta Chonos durante la primavera y el otoño la temperatura ronda entre los 5° y los 20° C, en el verano la temperatura se eleva un poco, oscilando entre los 10° y los 25° C, pudiendo existir algunos Days que supere la temperatura máxima. En la Ruta Kaweskar la temperatura en época primaveral y otoñal es aún más baja, promediando los 8°, en cambio en verano el clima es muy similar en ambas rutas. was built in the Skorpios company's shipyards between the years 1994-1995, under Chilean and international ship regulations, such as SOLAS, IMO, Classification ABS (American Bureau of Shipping), and AI ice, granting it to the high degree of reliability and security. It is equipped with the most advanced naval engineering system and navigation equipment (marine, radar, GPS, GMDSS, Global Maritime Distress and Safety System), security and salvage systems, fire stations, smoke sensors, sprinklers, Carbon Dioxide extinguishers, etc. In addition, it counts on a global satellite telephone service, for passenger use, according to the current rates. Equipped with the best 5 star nautical hotelier & navigating the Kaweskar Explorers Route, "Our Super Class", with an average capacity of 100 passengers, in 45 luxurious cabins with low beds. Amongst the services of the Skorpios that are highlighted are: (the bar is always open, without additional fee), passengers can visit all areas of the ship without restriction (from the machine room, to control the bridge, even the kitchen). Gastronomical needs are provided for without restriction & menu changes are accepted without additional cost, games and reading rooms, smoking and non-smoking bars, bilingual trip information, simultaneous chat translations, satellite telephone, cable & TV public and all of the commodities of hotelier that correspond to a luxurious service.